Caracas, Argentina - His Eminence Archbishop of Cetinje and Metropolitan of Montenegro and the Littoral kyr Amfilohije, within his visit to the Diocese of Buenos Aires and South-Central-American, as its first Bishop-administrator served on Sunday, December 4, on the feast day of the Entry of the Most Holy Theotokos in the church of St. George in the capital city of Venezuela - Caracas. 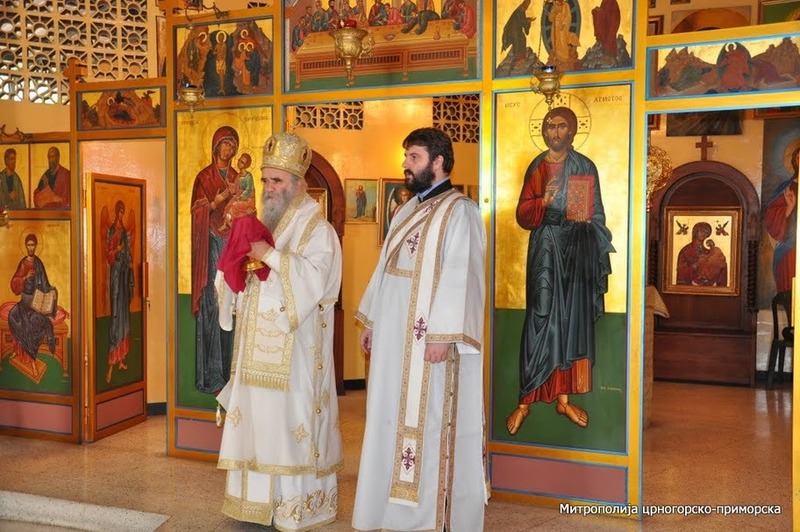 He was concelebrated by presbyter Bosko Stojanovic, parish priest of Buenos Aires and deacon Igor Balaban. Metropolitan Amfilohije held a sermon on the significance of the Entry of the Most Holy Theotokos into the temple of Solomon in Jerusalem and informed believers about the May decision of the Assembly. The Christian Serbian Orthodox community, as this parish is officially registrated in Venezuela, founded in 1955, mainly from political emigrants, who came to Venezuela after the World War Two, because of their disagreement with then Yugoslav communist regime. In 1969 this community built a church which was consecrated by Bishop Dionisije of America-Canada. The consecration was also attended by Peter II Karadjordjevic.